Loosely translated, Händlmaier’s Freunde means “friends of Händlmaier.” When a small group of friends in Bavaria got together for a meal, and determined that Händlmaier Mustard is THE best mustard, the original club was born. 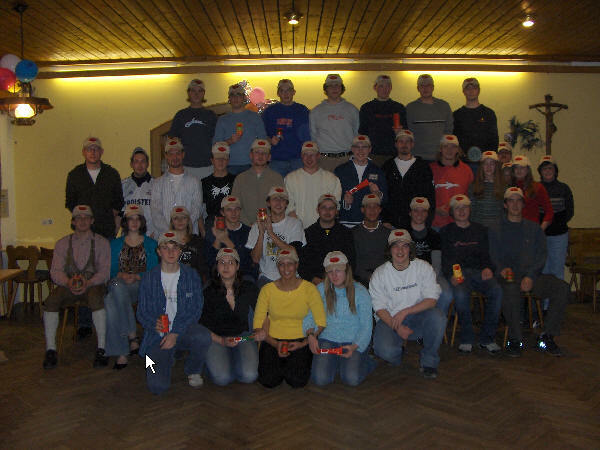 This was the club to which our founder Scott belonged while living in Germany. Greetings. My name is Gunsche and it is my honor to tell the history of the formation of the fan club. For those who ask about the purpose of our club, I give you our single purpose: we want to share a mustard with all of those on our Home Planet: The Louise Händlmaier-Mustard. I know that most people (especially those from the city and those who lack the appreciation of a fine mustard) think that the idea of this fan club must have originated after a few too many [drinks]. On the contrary, I want to share the truth from the bottom of my heart. It all began in early 2004 at the Rosenhof restaurant in Landshut, Bavaria. It was the 80th birthday of Hedi, one of my relatives. Everybody was sitting together – including both of my siblings, Mario and Kerstin, and both of the Walter boys, Tobias and Stefan. We began our family joke about which butcher supplied the sausages. This led to a discussion not only about the sausages, but about the mustard as well. We all agreed that Händlmaier’s is the finest mustard available, and that it can be found in everyone’s kitchen cabinet. At this point, enough of the ingredients necessary for the foundation of a fan club were present. At the Stube, our party hut, we told others about our idea for a mustard fan club. Interest gradually increased until an actual fan club could be founded. But official status came through the efforts of the old creek rat Rudi Lichtmannecker, who raised even more interest and organized all of the paperwork for the formation of the club. After the writing of a constitution of ground rules and a visit by a notary, a notice about the fan club was placed in a newspaper. At this point, the fan club became an e.V. (an official German non-profit organization). And since the article mentioned that a few too many were not imbibed, I must say: if in fact they were, I don’t remember anything about it. Hehe! So I now have to end this description of our history, since it is becoming a bunch of baloney. Translations in other languages can be found on our sister club’s website, Händlmaier’s Freunde Niederbayern e.V.